Good flexibility is desirable for optimal movement of your body parts. You improve circulation to the muscles when you decrease excessive muscle tension. More blood flow to the muscles means they receive more oxygen and nutrition. Better circulation of blood also means better waste removal. Hence, quicker removal of lactic acid and other byproducts. Reducing muscle tension and increasing circulation to the muscles also increases their suppleness. Your muscles will better absorb the shock and stress of every day movements, as well as athletic activity, when they are more supple. According to the American College of Sports Medicine, reductions in flexibility are evident in the third decade of life and progress with aging. We’ve all experienced times when excess muscle tension has produced discomfort or pain with normal, everyday movement. These times may have followed illness, injury, fatigue or extended periods of inactivity (like sitting or driving for prolonged time, or when rising in the morning). You are increasingly susceptible to this with advancing age. Stretching properly will help you relax, reduce tension in your muscles, improve circulation to the muscles and enhance your freedom of movement (i.e. flexibility). Yes, you can slow down part of the aging process. You can reduce some of those aches and pains. Research shows that a regular regimen of stretching and flexibility exercises can improve your quality of life. In one study, this was measured in adults 65 years and older who were tested for the effects of two types of activities on physical performance and well-being *. One group performed strength and endurance exercises and another performed stretching and flexibility exercises. At the end of one year, both groups improved in the respective activities they were engaged in. However, only the stretching and flexibility group reported fewer aches and pains in daily living. Stretching is a viable means to improving your quality of life. Stretching exercises are any movements performed, or positions held, in order to increase flexibility or decrease muscle tension. Your flexibility is the available range of motion around your joints. Muscle tension is the resistance to lengthening of a muscle due to activation from the nervous system. Dynamic stretches include coordinated movements, sometimes including bouncing or rapid type movements. These are more often helpful as part of a warm up routine for athletic participation. Proprioceptive Neuromuscular Facilitation (PNF) is a method using various contractions of the targeted muscles and their antagonists. PNF is often used as a therapeutic aid to increase range of motion, muscle coordination and correcting specific neuromuscular dysfunction. It is also used for preparation to athletic participation. Dynamic and PNF methods of stretching require skilled coaching in order to be performed adequately and safely. Static stretching involves holding positions that impart gentle stretch to the muscles and their connective tissues. Static stretching exercises are easier and safer to perform, thus more readily available for the general population, as home exercises. 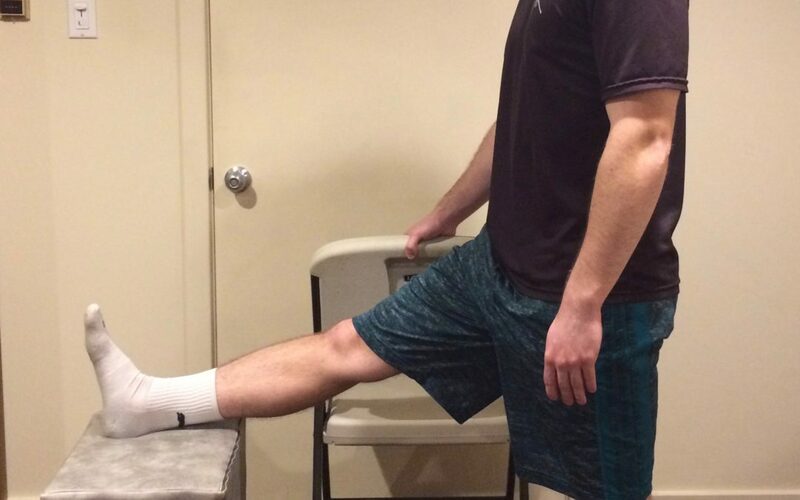 This type of stretching can be more easily learned.This is why my blog covers mostly static stretching. Stretching exercises should be performed frequently and regularly. Everyone should stretch a little every day. In so doing, you will help counteract the adaptations to poor muscle length acquired from those less-than-optimal postures, in which you spend a lot of time. Your body is a constantly adapting organism. If you move and stretch regularly, your body will more readily remain pliable (supple). Muscles will adapt to the position in which they are most often placed. The longer you sit still, the more likely some muscles and other body tissues will stiffen. When we sit, the muscles in front of our hips (the hip flexors) and in the back of thigh and knee (hamstrings) are in a shortened position. When we stand to walk, the hip flexors and hamstrings need to lengthen to allow our hips, knees and backs to function properly in an upright posture. Placed in the shortened position as in sitting for hours on end, day after day, these muscles naturally tend to shorten. Without regular intervention, as in physical activity and stretching, it becomes harder and harder for these muscles to achieve the optimal length for allowing normal function of our joints. Hence, it becomes increasingly difficult to stand upright and move freely. You should stretch when muscles are warm and pliable to improve flexibility. Warm up with a brief bout of light physical activity before stretching. It only takes a few minutes of movement (about five to ten minutes). This will increase blood flow and make the muscles more pliable. Warming up makes your muscles more receptive to the length imparted on them by stretching exercises. If you start slow, and progress slowly, stretches can be performed at any time. Hold your stretches for longer periods (up to 30 seconds, or more). This will allow the muscle fibers and fascia (other connective tissue) to relax. In order to increase the length and extensibility of muscles, they need to be relaxed. Rapid stretches and strong pulls will cause muscles to reflexively contract. This natural reflex (known as the stretch reflex) protects our bodies from injury. It is imperative to bypass this stretch reflex. 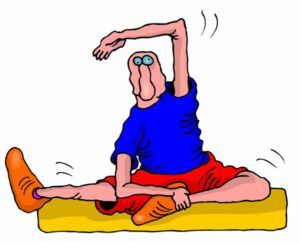 Act slow and be gentle, when doing static stretching exercises, and your nervous system will allow the therapeutic letting go. What should stretching feel like? Stretching should never cause pain. You should always feel relaxed and refreshed from a stretching routine. You should always know the reason for a particular stretch and which muscle region you are targeting. This will help you focus on the positive effect, at the desired body part. If you feel any strain on other body parts, while trying to focus on a particular region, you should reposition yourself for comfort. You may need to learn an alternate stretch that focuses on your target area, without straining anywhere else. Seek coaching from a fitness professional to help you tailor exercises to your specific needs. In conclusion, it is well worth your while to invest time in yourself with stretching exercises. You can help yourself reduce some of the aches and pains blamed on getting old. You will improve your quality of life by making everyday movement easier. And you will provide a healthier environment for your muscles and other body tissues. To learn how to stretch specific muscles, read my blog, where I give specific instructions and explain why each muscle group needs stretching. Suggestions made in this publication are no substitute for medical advice. If you have any pain or difficulty performing stretches, consult with a health and fitness professional or your doctor. “The Recommended Quantity and Quality of Exercise for Developing and Maintaining Cardiorespiratory and Muscular Fitness, and Flexibility in Healthy Adults.” Medicine & Science in Sports and Exercise: Vol.30, No.6, 1998, Position Stand by the American College of Sports Medicine. * “Comparative effects of two physical activity programs on measured and perceived physical functioning and other health-related quality of life outcomes in older adults.” Journals of Gerontology Series A: Biological Sciences and Medical Sciences, Vol. 55, Issue 2, M74-M83, 2000, by the Gerontological Society of America.